As you may already be aware from my multiple posts mentioning it, we took a little trip to Santa Fe last week for our belated honeymoon/one year anniversary (pics from the trip can be found here). 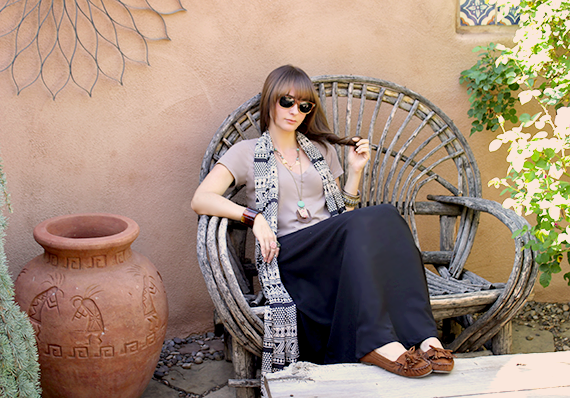 The town has such a laid back, boho vibe, and this outfit seemed perfect for it. (I actually wore it two days in a row. Oops.) 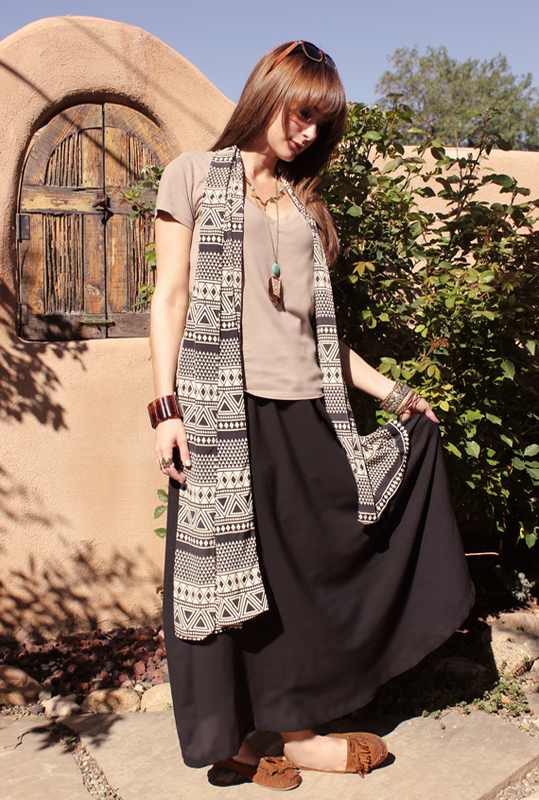 The black maxi skirt has been on regular rotation for me since autumn started, as has the tribal patterned scarf. It's such an easy look and so comfortable, but I still feel somewhat put together when I wear it. Despite my affinity for the skirt and scarf, it was definitely the other accessories that made this look for me. The necklaces and sunglasses are both really special, with wonderful stories behind them. 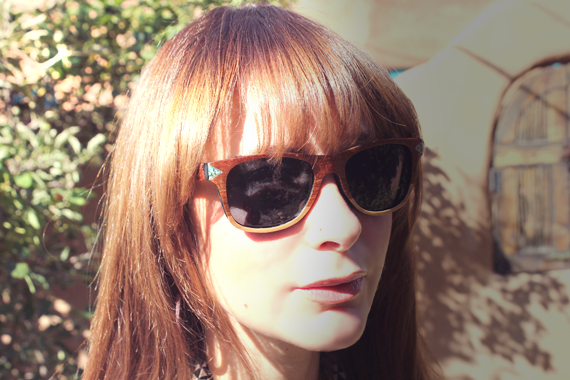 The sunnies are called "The Melissa," and are a result of a collaboration between myself and the absolutely amazing Tumbleweeds Eyewear Company. If you're not yet familiar with them, I highly recommend checking them out ASAP. 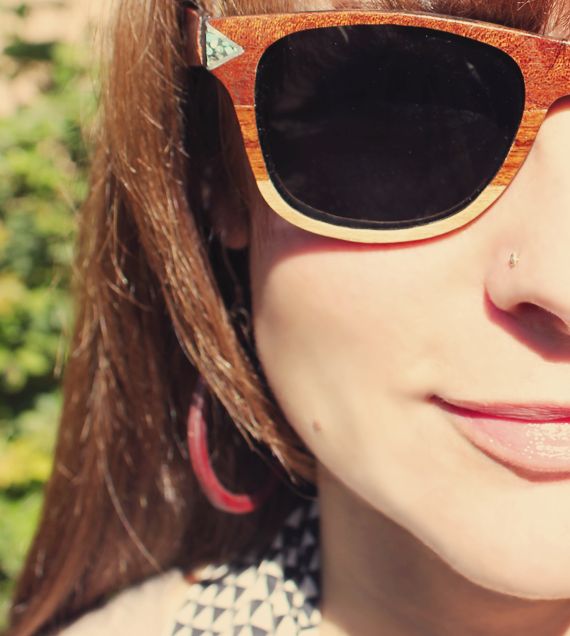 They create the most beautiful wooden glasses and sunglasses I've ever seen, and they happen to be really awesome people too. A couple of months ago, they approached me about co-designing a limited edition style as part of their blogger series. I am a huge fan of triangles, turquoise, and different wood combinations put together, and as you can see, they were able to include all of these things in this one design. I'm being completely serious when I say that they are by far the most incredible pair of sunglasses I've ever owned. To make things even better, Tumbleweeds is donating 10% of sales from them to a charity of my choice. (I told you they were awesome people!) I decided on Grey Muzzle, an organization devoted to finding forever homes for senior dogs. (You might remember them from my birthday post after Bubby dog passed away). Check back in a day or two for more on that, along with as a chance to win your very own pair of Melissa's. The beautiful necklaces were sent to me by the ridiculously talented Laura from Roots and Feathers. A lot of my style posts feature Laura's stunning jewelry, and on any given day, I'm sporting at least one piece of her work. Her designs are made with so much love, and I really admire her efforts to always include elements of nature. The longer necklace, called the Rosyln, is made from a soft, marbled brown recycled leather, vintage floral trim and a turquoise bead. I couldn't take it off for the entire trip (even when we hiked Bandelier National Monument!). The shorter necklace with the triangle and arrow is called the Zuni - a name which couldn't have been more perfect for New Mexico. I love the way they look paired together. 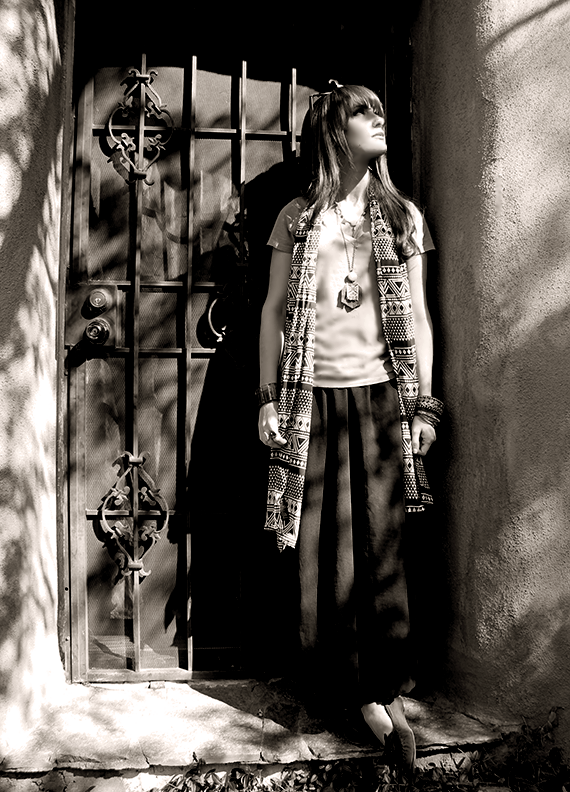 And they gave my outfit the special oomph it needed to make me feel just a little bit dressed up while we went shopping that afternoon in the boutiques and galleries that dot the Santa Fe streets. Do you have a favorite casual-yet-slightly-dressed-up outfit this fall? That place looks absolutely gorgeous (and so are you!) I'm in love with those sunglasses, though! tumbleweeds are the best! Codesigning! How fabulous! Those glasses are gorgeous. Congrats on the sunglasses, because they are AWESOME! You and Tumbleweeds should definitely work together again, especially if these are only limited edition. 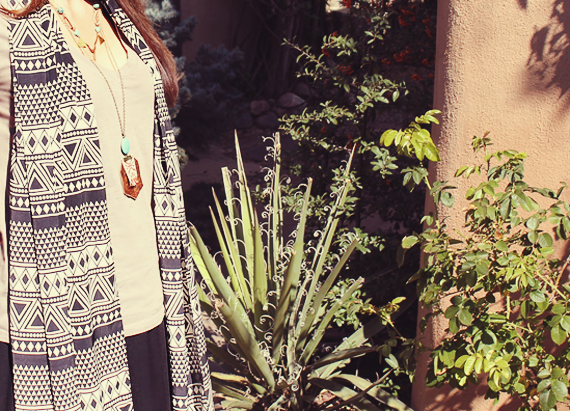 And, those two necklaces paired together just completely finished off the outfit. Love it! Eeeep, such pretty pictures and outfit!!! The style is perfect on you!!! Kudos to your photographer! I especially love the framing in the top photo with the flower-like wall decor blooming out from behind your head. 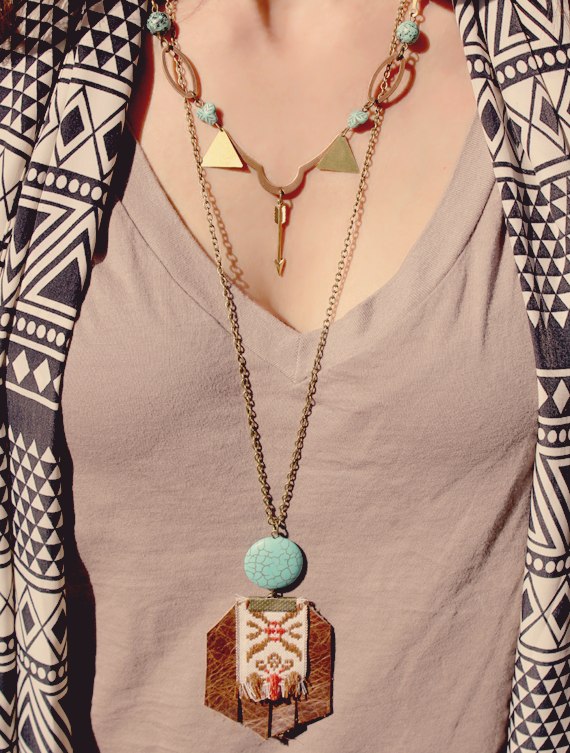 The Roots and Feathers necklace with the arrow is AMAZING, and I've grown very fond of small faces. Your casita is beautiful. I do hope you will have a chance to return to such a lovely place sooner rather than later! You have such a beautiful sense of style--casual and elegant all at once. Gorgeous outfit! It looks so comfy and cute. And your sunglasses are awesome!! What beautiful photos! Kudos to your photographer, especially the first photo--brilliant framing! Your sense of style is so lovely...casually elegant. I am particularly fond of the Roots and Feathers necklace with the arrow. Normally I'm not a fan of geometric shapes in jewelry, but this has such a softness to it despite the hard lines of the triangles. I am also very fond of small spaces, so I enjoyed all the different views of your patio and your comment about the call of it all to live in such a place. 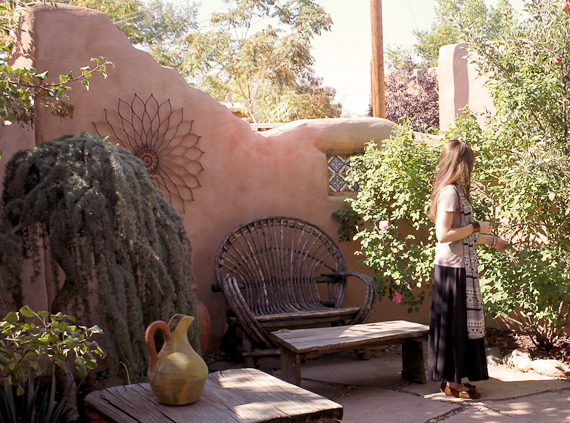 I do hope you will have the opportunity to visit Santa Fe again! What a GORGEOUS outfit and totally beautiful backdrop. Love the outfit, the AMAZING glasses, and learning about The Grey Muzzle, which is new to me, but so fantastic! Thanks for this post. :-) Hope you had a great time. we think you're just lovely! super pretty outfit and accessories. i love the adobe stuff in the background. Newest follower! You blog is incredible! Those sunglasses are gorgeous! I want a pair because my name is Melissa, too. This entire look is great. 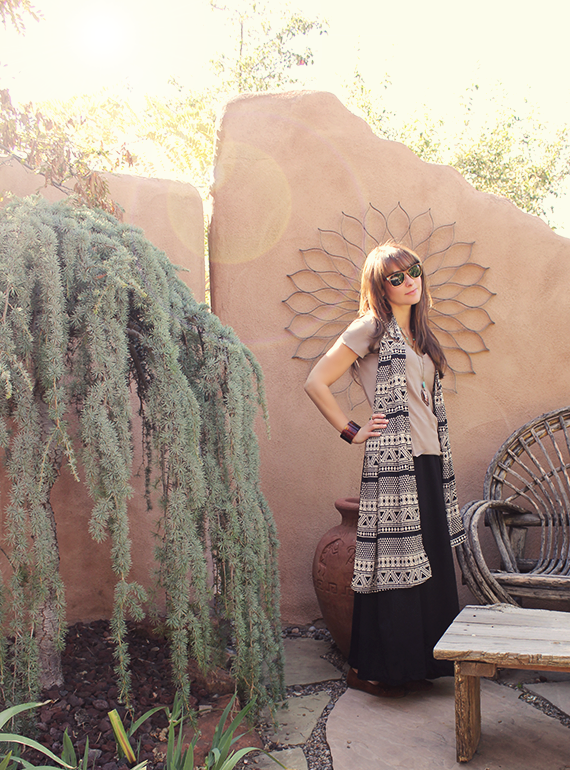 Love your outfit there and the patio... Just amazing!